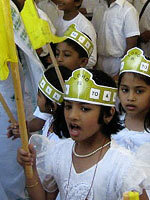 The Orthodox Vacation Bible School (OVBS) has been a longstanding educational outreach program of the Malankara Orthodox Church. It provides our younger generation with an opportunity to learn more about the basic tenets of the Orthodox faith through participation in a fun and interactive program that takes place over a series of days. OVBS focuses on deepening the knowledge and experience of the Orthodox faithful and embraces the teachings and traditions of Orthodox Christianity: Scripture, saints, feasts, prayers, worship and music. Also, the curriculum will attempt to teach and engage participants in the following areas: classroom lessons & discussions, memory verses (from Bible and/or parts of Orthodox tradition â€“ especially prayers), songs/hymns (liturgical & non-liturgical), Orthodox worship/prayer, activities, arts & crafts, recreation, and more. The theme for 2010 OVBS will be taken from St. John 11:28 - "The Teacher is here and is calling for you." For more information please visit: http://indianorthodoxsundayschool.org/user/ovbs.aspx.